Now, this one’s strange. VERY strange. ‘Tusk’ is Kevin Smith’s new film, based off of one of his Podcast. I don’t know too much about the back-story. And even when I came to see this film, I really didn’t know what to expect. Without spoiling too much, the film is about a Podcast Host (Played by Justin Long. First time I’ve seen him in a long time) who goes to Canada to find somebody to interview. And not just a normal person, someone strange and interesting. He finds a strange old man, and to be blunt, this man in insane. And wants to turn the Podcast Host into a Walrus named “Mr. 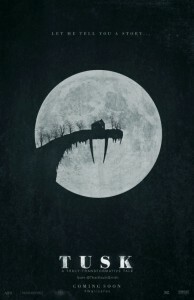 Tusk. Yes, you read the correct. The film is about a crazy guy turning another human into a Walrus. -The creepy tone lasted the whole hour and forty minutes of this film. It kept your interest the entire time, no matter how weird it got. -This movie made me miss Justin Long. – It was paced. Not too many characters in this one, but each one got time to develop. I connected pretty well to everybody. – A really sweet cameo by Johnny Depp (he was in this one for longer than I thought). -The dialogue (like all of Kevin Smith’s films) was very well done. Every line meant something to the story. -Sometimes, as interesting as it was, there were a few scenes that seemed too long. I’ve never once left a movie speechless. And I’ve seen a lot of weird movies. This one takes the cake when it comes to strange. I don’t think that’s a bad thing. Sometimes, we need a little weird in our lives. And Kevin Smith has master the idea of a “Weird yet good” film! It was paced very well, and the last half an hour has you wondering if you’re enjoying or hating this film. But, after a day of thinking about it, I really enjoyed it. Spend money. This is a fun, weird, different, yet well written movie. After you watch it , go to the Zoo and say hello to a Walrus.